Exploring the old Stratford - allow about 40 minutes. 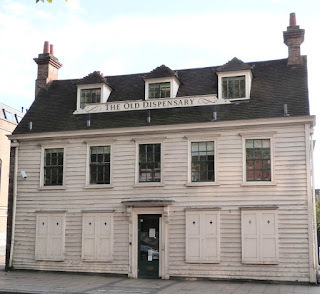 Stratford has some intriguing old buildings that are worth a visit. To get to them, turn left from the station and cross the road towards Stratford Centre. Unusually for an modern centre, there is a section devoted to fruit and veg and fish stalls which are piled high with exotic produce. Wander past the stalls and shops to reach the exit marked 'East Mall'.Continue through this. When you emerge into the Broadway, you will see over the road the imposing Old Town Hall. When I first came to Stratford there were five statues perched on the parapets, the only survivors of ten allegorical figures. Now they have all disappeared. Anyway, turn left and head towards the church, but before you get there, notice the large granite obelisk which commemorates Samuel Gurney (1786-1856), a resident of West Ham whose sister was Elizabeth Fry, the prison reformer. He himself played a significant part in securing the emancipation of black slaves. 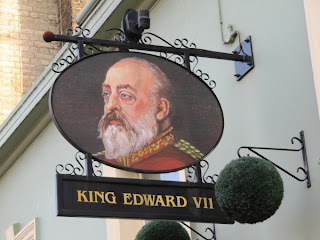 If you have ever noticed the numerous cattle troughs dotted around London, nowadays often planted up with flowers, you might be interested to know that he was the moving force behind the Metropolitan Drinking Fountain and Cattle Trough Association that funded them. Continue to St John’s church, with its impressive memorial to Protestant martyrs burnt at the stake on Stratford Green in 1556. It stands in a large graveyard, but today few other memorials remain. Cut through to the other side of the island site and pop back along the railings to the lights. Cross the road to have a look at the old King Edward VII pub. It was originally called the King of Prussia, but, not surprisingly, was re-named in WW1. It has a somewhat strange early 19th century door on the right-hand side with a surround reminiscent of a theatre box. Continue along The Broadway towards the junction with Romford Road, passing the 'Stratford Office Village'. The Old Dispensary (No. 30 ) is an unexpected treat. 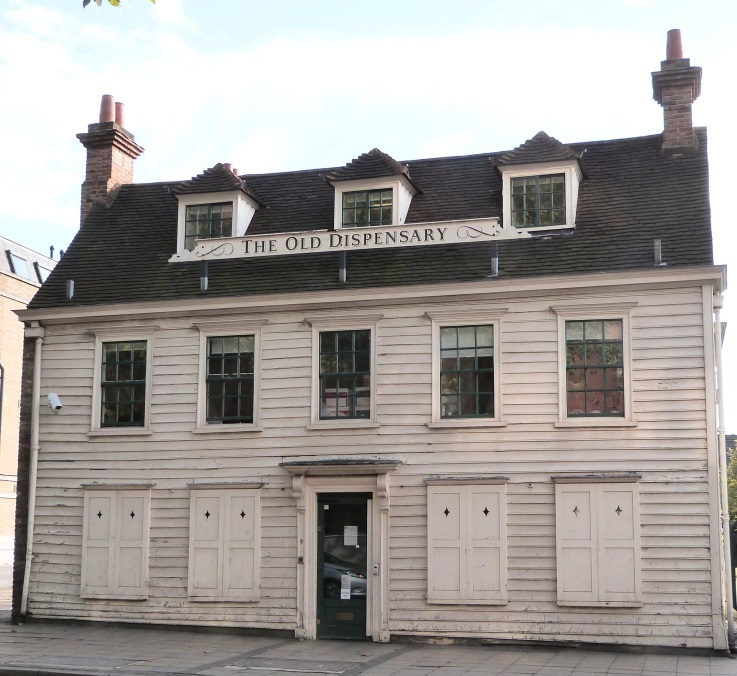 This three-hundred-year-old weather boarded building was a used as a dispensary in Victorian times, chiefly supplying medicines to the poor. It has a little garden at the back. Walk a bit further on - the road becomes more residential, with nineteenth century villas and terraced houses. Just after Tennyson Road glance to the opposite side of the main road for the Working Men's Club (1905). Cross at the lights and go over Deanery Road. Soon after, at the corner of Water Lane is the University of East London Stratford Campus. This cheerful set of buildings was originally the Central Library and Technical Institute. Lots of reliefs and figures – there is something endearing about the cherubs busy studying in the frieze that adorns the frontage in Romford Road. Round the corner in Water Lane they are playing music. Below them is a relief, in a completely different decorative style, depicting an eagle, shielding Art and Industry. Shakespeare gets a look-in with a statue in Coade stone standing in front of the Library entrance in the limited space between buildings and road. After the University, go further down Water Lane and cross the road opposite a large building, once a school for the deaf. Walk to the right, passing Manbey Street. On the corner of Manbey Grove is the former butcher’s shop (now offices) on the corner of Manbey Grove. You can't miss it, as it boasts several key-stones adorned with cow's heads. Next wander down Manbey Grove itself, a pleasant street of small terraced houses. Turn right into The Grove. The old Grove Picture Palace, situated a few metres down the road past the Baptist church, was a very early cinema, dating back to 1910 with an unusual kiosk ticket office bay window, still visible on the road frontage. It became a billiard hall and is now used as a doctors’ surgery. Fans of heavy metal music might like to continue to the end of the road to see the Cart and Horses pub which has a large sign declaring that it's the birthplace of Iron Maiden. There's also an unusual horse weather vane. Retrace your steps, passing Manbey Grove, and cross the main road at the lights near Grove Crescent Road. Walk to the left, towards the Broadway, past the R.C. Church of St Francis of Assisi. Cross the busy Great Eastern Road. You will see the church of St. John ahead, left. Opposite the end of the churchyard you will see Salway Place, an alleyway. Go down this and at the top turn left, where you will find the white ,angular Stratford Picture House (Burrell, Foley, Fischer 1997). At the turn in the alleyway is the brightly painted Theatre Royal. 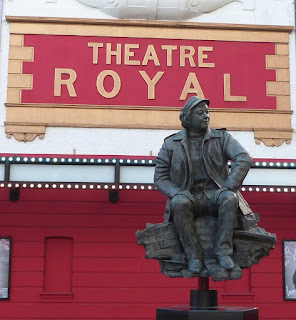 Originally opened 1884, in 1953 Joan Littlewood and her Theatre Workshop Company literally restored the derelict old theatre with their own hands. They gradually built up a tremendous reputation, with contemporary plays frequently transferring to the West End. In the 1960’s the theatre had to be saved again – this time from the threat of demolition. The full history of the theatre makes interesting – and rather sad – reading. 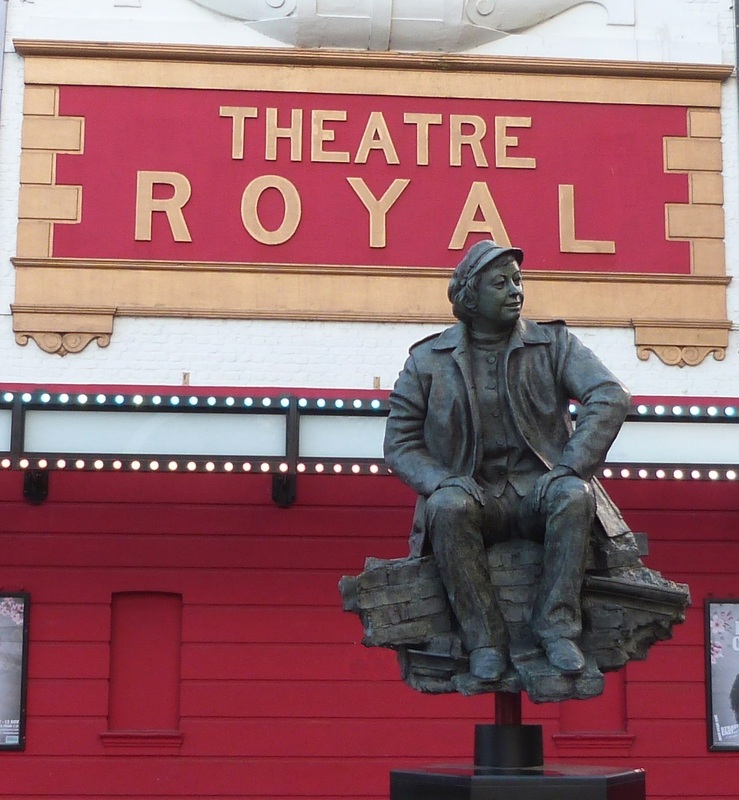 Outside is a splendid statue of Joan Littlewood by Philip Johnson (2015). Return to the Tube via the Shopping Centre entrance at the back of the Theatre. Stratford is just one walk from the many to be found at London Tube Rambles. There are architectural gems, beautiful country views, historic places and quirky buildings even in the most unpromising areas covered by the outer London Underground stations. 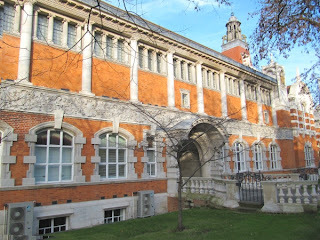 Usually the discovries are within a mile of the Tube - often only five minutes walk away. If you reached this as an individual page via a search engine, you might like to go to www.londontuberambles.co.uk to see the other destinations explored. You'll be amazed at what's out there!